Omphalitis can be caused by gram-positive (staphylococci, streptococci) and gram-negative microorganisms (Escherichia coli, Proteus, Pseudomonas aeruginosa). Predisposing factors: defects in the care and treatment of the umbilical wound, various manipulations in the umbilical wound (installation of an umbilical catheter, intubation), and others. Some information about an umbilical wound. The cord usually falls off on the 3rd-4th day of a baby’s life, after which the umbilical wound covers with a bloody crust, which gradually dries. By the 10th-14th day of life, there must be complete epithelialization (covering of the wound with a thin layer of epithelium). So normally an umbilical wound completely heals on the second week of a baby’s life. By the 14th day of a newborn’s life, his belly button must be absolutely dry. How does the infection get into? Omphalitis can get through the fabric, adjacent to the navel. The pathogen can get into the body even transplacentally (through the placenta, before the birth). The infectious agent can enter the body through the remnant of the umbilical cord or directly through the umbilical wound. Next, the infectious process leads to the development of inflammation in the surrounding tissues. If there is a further spread of the infection, the inflammation goes into the veins and blood vessels, leading to phlebitis (damaged veins) and/or arthritis (damaged arteries). of the umbilical vessels. Catarrhal omphalitis: this form is also known as the «weeping navel». Sometimes the wound may be covered with a thick bloody crust under which the discharge accumulates. In cases when catarrhal omphalitis prolongs for more than 2 weeks (with treatment) it can develop into belly button fungus. Infants with large body mass at birth and those who have a thick cord and a broad umbilical ring are prone to the development of belly button fungus. If left untreated, catarrhal omphalitis develops into purulent omphalitis. If the infection spreads even further, the inflammation goes deeper into the umbilical tissue, which leads to the development of phlegmonous omphalitis. Phlegmonous omphalitis is a bacterial inflammation of the bottom of the umbilical wound, umbilical ring, and of the subcutaneous fat around the umbilical ring. This disease begins much alike catarrhal omphalitis. However, after some days transparent discharge from the wound turns into purulent. The umbilical ring becomes swollen, there is pronounced redness in the umbilical region. The subcutaneous fat becomes dense and starts bulging above the anterior abdominal wall. The skin around the navel is hot. Dilated vessels and sometimes red stripes are seen through the skin. Very often phlegmonous omphalitis is accompanied by an infection of umbilical vessels. In this condition, the baby’s health is violated. The baby becomes sluggish, he doesn’t want to eat, doesn’t gain weight. The body temperature rises. Blood test shows leukocytosis (increased number of white blood cells) and increased erythrocyte sedimentation rate (indicating the bacterial nature of the inflammation). Phlegmonous omphalitis is dangerous as it may lead to the development of metastatic fociof infection (i.e. the infection will spread through the blood to other organs), to sepsis (mainly in premature and weak newborns), and to the peptic ulcer. Necrotic omphalitis is one of the possible complications of phlegmonous omphalitis. It mainly occurs in premature infants with various immunodeficiency problems. The inflammatory process extends deep into the tissue. The skin is of a purplish-bluish color and it detaches from the underlying tissue. Usually, the wound is vast, and in most severe cases, there may be eventration of the intestine (intestine is seen through the hole) with the development of peritonitis. The health condition of the newborn is bad. There are evident symptoms of intoxication. In most cases, necrotic omphalitis ends in sepsis. This information is only for reference! Consult your doctor! Сatarrhal omphalitis can be treated at home under the supervision of your pediatrician, while babies with all the other forms of omphalitis need hospitalization. The main goal of treatment is to prevent the accumulation of discharge under the crust. First, wash it with hydrogen peroxide solution (3%). Use a sterile pipette to do this. After that, dry the navel with a cotton swab. Then treat the umbilical wound with one of the alcohol or water solutions of antiseptic (furatsilin, dioxydinum, chlorophyllipt). Repeat the procedure 3−4 times a day. It’s also a nice idea to add a weak solution of potassium permanganate or decoction of some herbs (beggars-ticks, chamomile, celandine) into the baby’s bath. Phlegmonous omphalitis is treated with the help of antibacterial drugs — locally (swabs with antibacterial agents), and systemically (injections, tablets). An expressed intoxication syndrome may require infusion therapy and detoxification. Necrotizing omphalitis/fasciitis treatment includes surgery (the necrotic tissue must be excised), taking antibiotics, eubiotics for the prevention of dysbiosis, and detoxication therapy. Physiotherapy is also used for the treatment of omphalitis — ultraviolet irradiation, electrophoresis, and UHF-therapy. In some cases, newborns may need a course of immunotherapy. If umbilical vessels are affected heparin and an antibacterial ointment (Mupirocinum, Bactroban) are used. The prognosis for recovery is favorable. But, the children who suffered from omphalitis, further are prone to the development of portal hypertension. Caring for infants. How to take care for your newborn? 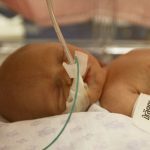 What to do if a newborn doesn’t sleep well?